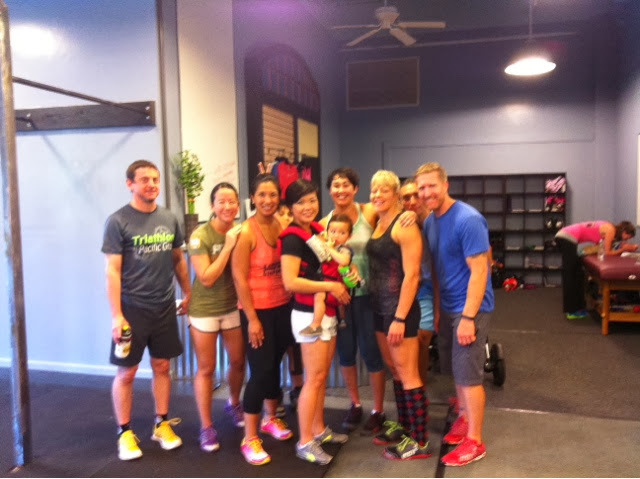 Good time at Systematic CrossFit for our going away. Potluck and workout. Used a 45lb plate for runs and c&j. Went bak to the Way. Need to revitalize my training. May not have the stamina to stay at it 100% but we shall see. Yesterday evening hit tabata FGB. 210, got under 215 but couldn't stand it up. Then ran ~3.3 miles, ~24:00. Quick warm up (which should have included a run but did not). Today should have been the Frogman Challenge. Kinda wish it had gone as planned, but what can you do? Ran home, ~3 miles in ~24:00, easy pace. P1 does 500m row while P2 does 10xOHS@115# then ME muscle ups.